Beginning today, the Lakewood Brewing Company will be rolling out the latest beer in their Seduction Series, a line of products featuring specialty treatments of one of the area's most popular brews. 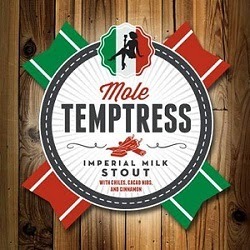 Mole Temptress, appropriately hitting taps just ahead of Cinco de Mayo, is the brewery's imperial milk stout infused with cinnamon and cacao nibs, along with a blend of ancho, chipotle, guajillo and pasilla chili peppers. Balance and body are the words that initially came to mind when sampling this beer at a pre-launch event this past Friday. The reason being that these are qualities I've found to be lacking in many brews of this type since they first appeared on the market a couple of years ago. Far too often, efforts have either been peppered to the point of being undrinkable, or so light in body that the concoction ends up drinking more like spiced water than anything resembling a beer. Mole Temptress, though, is something not lacking in either. While each of the aforementioned ingredients is clearly evident in flavor and aroma, they enhance rather than overpower the underlying brew. The cinnamon is most prevalent upfront, but gives way quickly to the earthy chocolate character imparted by the cacao nibs. As for the peppers, outside of their taste they contribute a slow, subtle burn in the finish. According to brewery founder Wim Bens, the controlled heat is the result of removing the seeds and stems of the peppers prior to adding them to the beer. In terms of body and feel, the mole-inspired makeover seemingly doesn't sacrifice much, if anything, in comparison to the original Temptress. It also doesn't appear to suffer in terms of head retention, which can be adversely affected by oils in either the peppers or cacao nibs. All in all it makes for something that drinks exactly as a spiced or specialty brew should, giving the impression of being a "harmonious marriage of ingredients, processes and beer" (to borrow from the BJCP). Mole Temptress is draft only and available for a limited time. Look for it at bars and restaurants that typically carry Lakewood's seasonal brews, a full list of which can be found on the brewery's Facebook page.